Start a tradition with this beautiful bonnet. 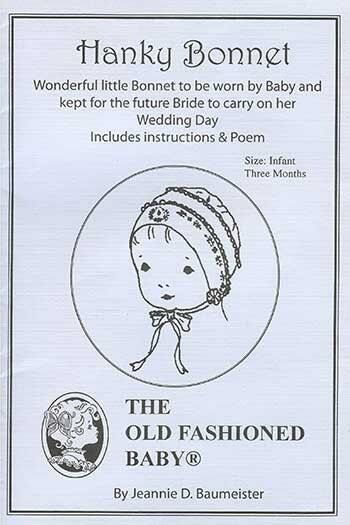 The Hanky Bonnet is a wonderful little bonnet to be worn by Baby and kept for the future Bride to carry on her Wedding Day. Patterns by The Old Fashioned Baby show the charm and daintiness that belong to every baby. Baby will be well and smiling in little garments made by Mother or Grandmother. These garments are designed to give baby the greatest comfort and freedom of movement. They come with complete, illustrated, easy to follow instructions. Check my store for other bonnet patterns. So cute idea to start family tradition! Item was as described and shipped / received promptly with friendly service from this shop.